Tag Archive | "trent morrow"
Newsflash – Save the Date, book the flights, fill up the car! Marathon Man Welcome Home Celebration Marathon to take place in Sydney, Australia on Sunday 1 June. 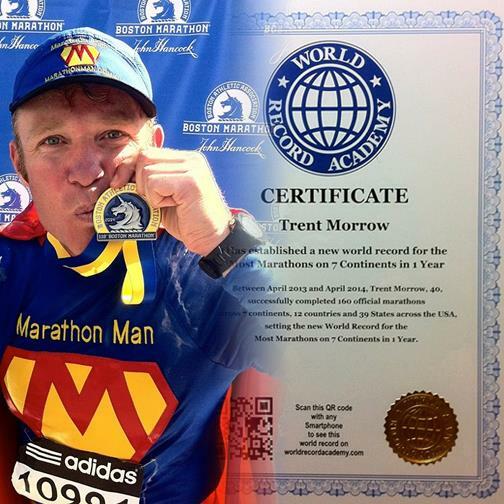 200 Marathons across 7 Continents in 476 days! Having run an average of one marathon every 2.4 days for the last 16 months, the Marathon Man World Record Challenge came to a close on 21 April 2014 at the iconic Boston Marathon. I am feeling incredibly inspired and proud to have the opportunity to pay tribute to the people impacted by the events at last year’s marathon. I will run with strength and purpose to honour your memory, as well as those of my Mum and Step-Mum. BOOM! Really emotional moment crossing the finish line of the Antarctica Marathon & Half Marathon in 5:50:31.